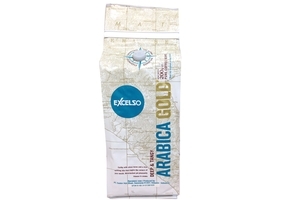 Excelso Arabica Gold Beans in 7.05oz (200g) pack. Excelso Arabica is Deep & Tangy Arabica Gold, Earthy with citrus tones and a nice uplifting bite that tingles the corners of your mouth. Mild-bodied yet pleasantly intense aroma. Product of Indonesia. Halal Certified حلال . Sumatera Mandheling Beans - 7.05oz.